The Geo-IK-2 is a follow on geodesy mission to the GEO-IK series. The satellite consists of a pressurized container, that is 1.3 m in diameter and length, heat-regulation shutters, honeycomb panels (with a radiator), and an astroplate with an antenna assembly and rigidly fixed solar arrays. The satellite is unified with other spacecraft manufactured by the JSC ISS. The satellite unification speeded up the process of its development. In particular, some elements of the electric power supply system and the thruster units of the propulsion system were taken from the Uragan-M (GLONASS-M)M spacecraft, parts of the attitude and orbit control system were borrowed from SESAT, Ekspress-AM and Luch-4. The GEO-IK-2 system consists of two spacecraft to perform geodetic measurements and determine orbit characteristics. The satellites are put into a 1000 km orbit by Rokot-KM, Soyuz-2-1v Volga or Angara-1.2 rockets launched at the Plesetsk cosmodrome. The first launch on board of a Rokot-KM booster took place on 1 February 2011. The launch failed to reach the correct orbit and ground controllers were initially not able to establish contact with the satellite called Kosmos 2470. 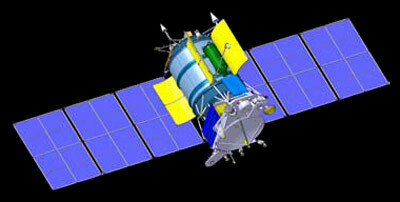 After evaluations to use the satellite from this orbit, it was finally declared a total loss in June 2011. It reentered on July 15,2013. The second satellite was ordered to be launched in 2014, but the launch has slipped until 2016. In August 2012, a third satellite was ordered as a replacement for the lost mission. It is planned to be launched in 2018. 3-Axis stabilized Uragan-M bus ?